Compared to many other regions of the world, Africa is particularly vulnerable to the effects of climate change and variability. Widespread poverty, an extensive disease burden and pockets of political instability across the continent has resulted in a low resilience and limited adaptative capacity of African society to climate related shocks and stresses. To compound this vulnerability, there remains large knowledge gaps on African climate, manifestations of future climate change and variability for the region and the associated problems of climate change impacts. 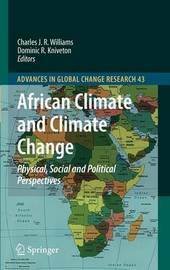 Research on the subject of African climate change requires an interdisciplinary approach linking studies of environmental, political and socio-economic spheres. In this book we use different case studies on climate change and variability in Africa to illustrate different approaches to the study of climate change in Africa from across the spectrum of physical, social and political sciences. In doing so we attempt to highlight a toolbox of methodologies (along with their limitations and advantages) that may be used to further the understanding of the impacts of climate change in Africa and thus help form the basis for strategies to negate the negative implications of climate change on society.